Petition Party to put Tony Smith on the Ballot! Join friends and neighbors for a casual meet and greet with Tony Smith. Tony is running for city council with an emphasis on putting neighbors first. He will build coalitions to fight for affordable housing, encourage a better transportation infrastructure, and promote health and wellness in the community. To learn more about Tony and his campaign, please RSVP here to join us at the Raines’ household on February 20th. Fundraiser to Support Tony Smith! 1358 N. Gilpin St. Denver, CO 80218, 1358 N. Gilpin St. Please join us on Thursday, February 28 5:30 – 7:00P.M. 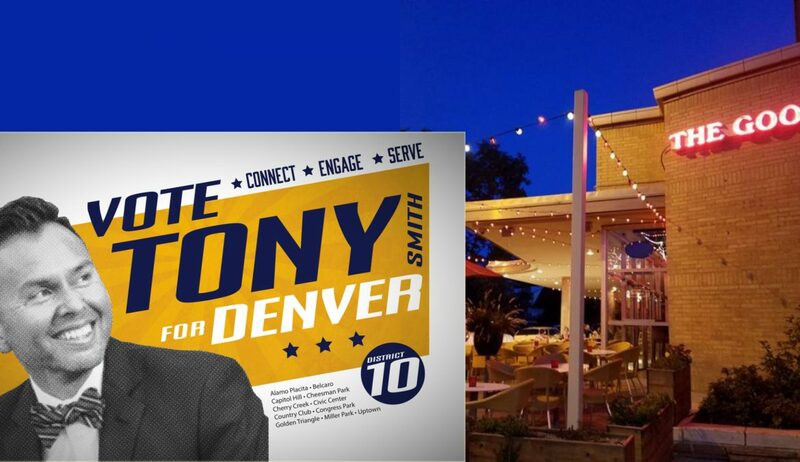 At the home of John Krotchko 1010 N. Ogden St. | Denver, CO, 80218 For a fundraising reception to support Tony! Click here to RSVP & Purchase Advance Tickets! The Home of Jack Finlaw & Greg Movesian, 918 York St.
Join friends and neighbors for a casual meet and greet with Tony Smith. Tony is running for city council with an emphasis on putting neighbors first. He will build coalitions to fight for affordable housing, encourage a better transportation infrastructure, and promote health and wellness in the community. To learn more about Tony and his campaign, please join us! Join friends and neighbors for a casual meet and greet with Tony Smith. Tony is running for city council with an emphasis on putting neighbors first. He will build coalitions to fight for affordable housing, encourage a better transportation infrastructure, and promote health and wellness in the community. To learn more about Tony and his campaign, please join us at Pints Pub on March 20th between 5 and 7 pm. LGBTQ For Tony Smith Fundraiser! Join friends and neighbors for a casual meet-and-greet with Tony Smith. Tony is running for city council with an emphasis on putting neighbors first. He will build coalitions to fight for affordable housing, encourage a better transportation infrastructure, and promote health and wellness in the community. To learn more about Tony and his campaign, RSVP here to join us at the Rohan household on April 11th between 6 and 7 pm. Meet us at the Goods Restaurant ~2550 E. Colfax Ave. from 10:00A.M. – 1:30P.M. to talk to neighbors and have them support Tony Smith for Denver City Council, District 10. Meet us at the Goods Restaurant ~2550 E. Colfax Ave. from 1:00P.M. – 4:30P.M. to talk to neighbors and have them support Tony Smith for Denver City Council, District 10. Meet us at the Goods Restaurant ~2550 E. Colfax Ave. from 12:00P.M. – 3:30P.M. to talk to neighbors and have them support Tony Smith for Denver City Council, District 10.